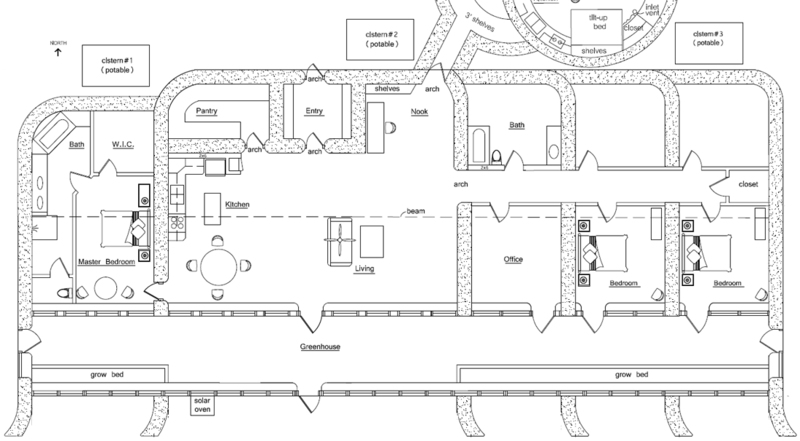 What is the feasibility of a below-ground basement for this houseplan? That is possible, no problem. I have two earthbag basement designs on my websites. These are experimental. You could also use ICFs (insulated concrete forms). This would make it easy to get a building permit and provide insulated basement walls. are your plans ready to sell/build? i don’t see a place on the site for pricing and ordering. Yes, it’s passive solar and bermed in the back. The garage is extra. People buy my basic plans and them want them customized. Your images are cropped, and part of the floor plans are cut off. I am very interested in the custom plan you have here. Would you be able to fix the photos of the floor plans? I only show the basics on my website to help reduce copying. You’ll get the original images with dimensions, etc. if you buy them. Will you have the custom zero energy four ready for order soon. It was finished about a year ago. My husband and I are planning to build in the next year or so and we are planning on purchasing an alteration of this plan from you. However, after having read through your site I’m left wondering what is the best material to use on the north walls that will be underground as we live in a very cold but dry mountainous area of Wyoming. We don’t get a lot of rain, but we get around 40 inches of snow per year. Our original intent was to use earthbags but I am concerned about the loss of heat into the ground. We’ve discussed strawbales, but I am not sure of how they will hold up with the moisture from the ground up against them. We have also discussed earthbags filled with scoria, but my husband is concerned with the stability of the walls as the bags degrade over time. What is your recommendation as far as having a stable but highly insulated wall underground? I usually call for 2′ earthbags on walls below grade. Add 2′-3′ of scoria fill on the outside for insulation. In addition, I often specify a steel post and beam structure for code areas. Poly bags don’t decompose if kept out of sunlight. There’s a blog post on our earthbag building blog about a Dept. of Transportation study that concluded poly bags will last 500 years or more if not exposed to sunlight. You can order the report online. Would something like this be a bad idea for the deep south (humid/hot/lot of rain)? There are better plans with more ventilation. You don’t need a greenhouse to produce supplemental heating. I’m wanting to build this in the Dallas area at some point. I don’t consider that *deep* south, and I get cold easily (I want heated floors, and did even when I lived in Florida). I decided on this plan even though I am in love with domes due to the greenhouse and the row of three bedrooms that I could turn into one big art studio by putting openings between each room. Would this plan be okay in the Dallas area, or would it be too hot in the summer? You could face the greenhouse to the north to prevent overheating. A north-facing greenhouse would work? Would it still provide the passive solar heating in the winter? It does get cold there in the winter. If I did all of the other things but still faced south, do you think it would be okay? I need to find some other people with houses like that in the DFW area. Only limited number of shade loving plants would work if you faced it north. I was trying to prevent overheating. I would choose a design such as Summer Breeze that’s designed for your climate. Now a few questions (and this is from comparing designs one, two, and four): I notice in designs one and two you label food storage as pantry, but in four, its labeled root cellar. I’ve read enough of the blog to see that you say the primary difference in the two is humidity level – how is that changed between the 3 designs? On the mock-up picture (more noticeable in one), what is the point of the massive overhang of the roof over the short side? If using the optional loft, what would be approximate ceiling height of the main floor, and also of the loft? On a related side note: I fell in love with the idea of natural building when I stumbled across links to straw bale building a couple years ago. Until today I was convinced I wanted a bale/cob house. Then I found your article on earthbag building on Mother Earth News. As it appears you have significant experience with all 3 mediums, which would you recommend as “best” for the very humid, very hot climate? Summer Breeze made with earthbags is better than zero energy homes, which are for colder climates. Strawbale is great, but earthbag is better in humid climates. The rootcellar/pantry shows how you could use either one simply by changing a few details. Roof overhangs are just recommendations, not absolutes. Most ceiling heights are 8′ in zero energy homes to conserve energy. Build 9′ high ceilings in hot climates for improved ventilation. We are interested in modifying the zero four design, mostly by removing the two bedrooms on the east end and then some slight shifts in door placements for some of the rooms. We know you have the zero two, but we really like the design of the four, especially the south facing greenhouse hallway. We are wondering about a few things from looking at the plans; is the entire north roof one slope or is it multiple sections since the kitchen/living area is longer than the bedrooms? Also, would this design be able to be modified to use dry stack surface bonded blocks instead? We are really hoping to avoid hassles with the building department and it seems that using a known building material like that would really help. Thanks in advance for your reply. We really love your plans. It seems like all those greenhouse windows would get really expensive really quickly. What would you recommend there? Buy double pane storm door replacement glass. That’s the lowest cost option unless you use recycled materials. I guess you could use greenhouse plastic on some windows. Hello! This is exciting! I am CEO of a very small aid organization, OneBigBoost, with many previous projects in Haiti – and I wish I had seen the house you bIult. If you tell me where it is, will send (a Haitian) Board Member or another friend to take a look for me! We are going to build a dormitory for elementary school children in a very rural, remote area in Nepal, hopefully making the way for another 100-150 kids to go to school. They need space for their mats and a small box for belongings – that’s just how it is done, as I was told by the principal. Looking at the grouped dome buildings, or at the Haiti structure w perhaps a small porch rather than a wrap-around, I see many great options for us. Especially the large circular building. I have contact with many companies in China that make rice bags, but most like to get me going on 200 000 bags. Not building a city I find that daunting. So volume+ is a problem. Any suggestions for Nepal? Secondly: are there alternatives to barbed wire that require considerably less weight, primarily, and danger? I have been trying to find out if we can purchase rebar there but, again, having it brought in by porters will be very costly and barbed may then be better. I am searching for alternatives. Because of seasonal issues and cleanliness, we must make a cement floor, which we may cover with layers of fiber and mats. Any alternative suggestions or warnings for that? Last but not least: we can use extra hands, Especially ones that have done this before. If we find additional funding it will go to the dormitory, the school, the garden we need to build to sustain the children, not to help people get there. We, as volunteers, always pay 100% of our own cost from flight to PB sandwiches. OneBigBoost, on the other hand, uses 100% of its donations for projects. Meaning: anyone who wants to join has to come up with $3400 for the month (includes everything except passports and chosen innoculations and 2 explorations) or $2800 for 2 wks (one trip.) We’re going the month of March. The villagers have to provide 1/3rd of the cost in the form of found materials and labor with us. Two people with us are physicians, many others teachers, artists. All ages. We really want to provide this for these children, who live a day WALKING away from the nearest public school. Any information, steering or help is much appreciated! My husband and I were wondering whether the Custom Zero Energy 4 plans had been finished as of yet. Hi Owen and all~ I like this idea of a passive solar house. It definately makes sense to use this for building like you have here and I am wondering if you can do it in the round? Isn’t it possible to do or does one whole side of the house have to be facing one direction? Thanks so much for your reply, I am aware of earthships, I meant is it possible to do this in a dome shape? I consider the shape of earthships similar to the design you have above. Or round home with roof? Seems easily possible, but I haven’t seen a dome home that’s using passive solar. Perhaps I look in wrong places. 🙂 Thanks again! Solar design requires adequate south facing glazing (in the northern hemisphere). It’s hard to get enough glazing on domes. Most builders use south facing window walls for solar gain. You could do this with roundhouses, earthships, Zero Energy houses, etc. Some of my roundhouses have lots of south facing windows. I see, thanks so much for your reply! Hey Owen, I’ve been spending way too much time lusting over your various housing ideas. This is the only site where I find the comments as interesting as the information presented. I am interested in the zero four custom floor plan listed above. I live in Northeastern Montana on a Indian Reservation. To say I don’t have much money would be an understatement. I’ve been living in my solar electric school bus for nearly 4 years and I’m really keen on having a “real” house. Anyway the idea would be to build enough of it this year to get me through the winter… we’ll see if I can pull it off. Anyway, there’s lots o’ oil related industry hereabouts. The reason I bring it up is because of the many references to “scoria” as a insulating building material on your site’s pages. Here scoria is used abundantly for oil filed/well pad construction. Well after some research into this, I find the scoria here is not “the scoria” referenced here. It looks similar in color but no bubbles Possibly you might wish to state, if you haven’t already, that scoria is not always scoria depending upon what area of the country one is in. The rock the used on railroad tracks around here does have the bubbly type of stone. With any luck I may be able to order up one of your plans soon! Right, there are different types of lava rock as we’ve explained before, and different names are used. You want the light, porous lava rock often called scoria. Also, we always advise starting on a small project such as a tool shed so you can develop the necessary skills. Thanks for your reply Owen. Unfortunately I have not always been one to follow the advise and wisdom of the more experienced. Why I don’t know? It makes sense to try building something smaller first. Maybe I will set up a little training area to get a feel for what to expect. I went to the library today and logged into their wifi. I watched the video you mentioned, plus several others with related content. I’m confident I could figure it out with some of your books and the various videos out there. I am considering using earth walls inside for the thermal mass. There’s an outfit out of austrailia that has a stabilized poured earth block system that I believe I could build/copy and save some of the almighty $’s. But yah, it’s all pie in the sky at this point. I do have a nice little spot to build on so that’s not a worry. I was planning on building a shed to store tools and materials however I was going to use a mini pole barn approach. I haven’t found a resource yet for the proper stone. I haven’t aquired the bags, I don’t have the plans lol etc. Building a wooden shed, rather than earth bag structure is more timely at this point. I haven’t worked out all the logistics of materials aquisition or delivery, The site I’m considering is out in the boondocks and even getting delivery trucks in there has to be worked out. Enough of my rambling. Thanks for your site and all the ideas therein. A wooden shed would be more expedient. So consider building a demonstration corner like I show in my step-by-step videos and this Instructable: http://www.instructables.com/id/Step-by-Step-Earthbag-Building/ This would only take half a day or less. The living space is 40’x 109′. The garage is 34′ wide. So total width is close to 74′. Yes, you could make a walk out basement. Please note, I no longer do custom plans so you’ll need to find someone local to make changes. Sorry to hear you’re no longer doing custom plans. My wife and I are planning on building an intentional eco-village. We were wondering– we are looking at Missouri to build, and I see you’ve diverted folks away from this design in the South. Missouri, unfortunately, gets both cold/dry Winters and hot/humid Summers. We thought that this design might work, if the greenhouse space were turned into an effective solar chimney in the Summer months? Just place vents at the peak of the greenhouse space to vent the warm air out, and use the vacuum to draw air in through ducts in the northerly bermed portion of the building. In Winter, those vents could be closed, and instead redirected into the living space behind, as well as a trombe-wall effect. With some good eaves/overhangs to shade the windows in Summer, we feel that it wouldn’t likely overheat. That would help a lot. You’re still missing cross ventilation through the living space. 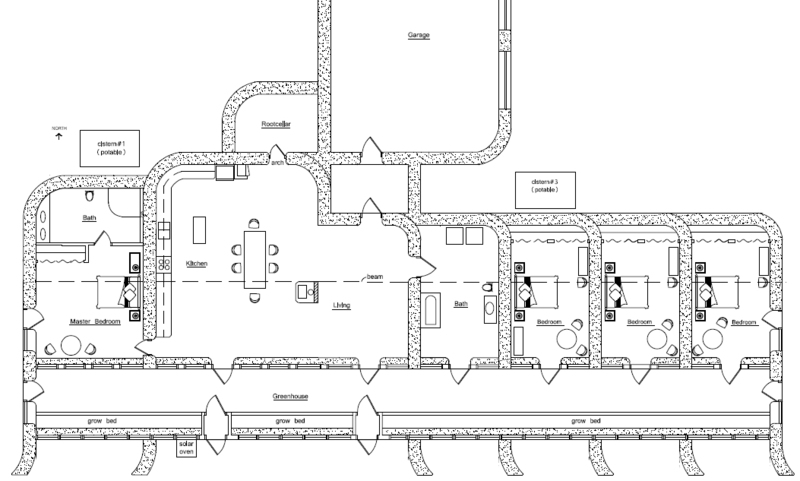 This plan now includes a free additional cutaway drawing showing the interior construction and layout. Custom zero four… If i order “zero four” does it come with the “custom zero four” plan/option? Regardless the custom would be my preference. Thx. This ought to be my last question…for now anyway. Does this design utilize timber at all? I have that resource and would like to utilize logs. I have noted earthship designs with log beams etc and i am wondering if your design is similar. Thank you. This uses a timber truss roof, so having your own logs should save you a lot of money. Also, the interior walls could be built with wood. Dr. Geiger! Long time reader, first time poster :-P. From what I’ve gleaned by reading through your various threads is that you no longer do new custom designs. I’ve also gleaned that you will offer custom plans that you’ve already done for the same $500. Is there a compiled listing or directory of these other custom plans that we can look through? If not, and if you’re willing, could I email you what I’ve photoshopped from the above Custom Zero Energy Four and you could provide whatever custom design closely matches it? We’ve been playing with your design and preparing our land in upstate NY for a couple of years now and we’re ready to start getting plans finalized and approved. Thank you in advance! Good day sir! I’m a long time admirer and I’m about to pull the trigger on an earth bag home in western NY. We REALLY like the Custom Zero Energy Four plan, though we need to adapt some changes. I understand you no longer do new custom designs, but is it possible to peruse the other custom plans that you have done? Thanks! I understand you don’t do custom designs any longer, but that you have customs that aren’t listed on your websites. If I include a link to our desired floorplan with our PayPal order of the Zero Energy Four, could you provide the closest custom match? Feel free to email me at naturalhouses [at] gmail dot com. Actually, that comment was for him. In the string of comments in my email thread yesterday, it looked as if he kept leaving comments and you kept telling him to email you. I didn’t see until today that there was a time difference. Will this one work in a tropical climate near the beach? I would really like to see what the custom zero energy four looks like when the drawing is finished. The drawings are finished, but very few people publish their projects. They don’t want hundreds of strangers showing up at their door.